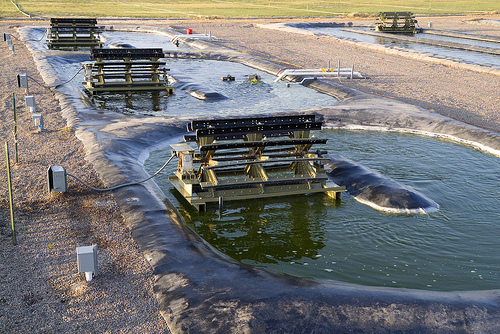 Algae biofuel production at Texas A&M University. Photo by AgriLife. Transport accounts for 20 percent of global carbon dioxide emissions. Although TheCityFix mostly covers personal mobility in cities, it is important to note that transport of goods accounts for a huge portion of global emissions. The use of alternative fuels to power cars, buses, light rail, personal cars, airplanes and other vehicles certainly could reduce gl0bal GHG emissions. Many alternative fuels for transportation are even more polluting than oil and many are not available at prices and the scale that meet motorists’ demands, according to a World Resources Institute (WRI) report, “Plants at the Pump” (view the PDF here.) (EMBARQ, the producer of this blog, is part of WRI). The major concerns with fossil fuel, according to the study, is that as production reaches scale, there are associated environmental, social and financial costs. carbon impacts from land use changes. The move towards sustainable mobility in cities does not simply involve biofuels and new technology but mandated efficiencies, land use changes, international trade changes, lifestyle choices and infrastructure upgrades. According to the WRI report, next-generation technology of biofuels, like native grasses and algae, will be lower-impact and lower-maintenance. These feedstocks “have more biomass yield per acre than corn because the technology enables conversion of the cellulose rather than just the kernel and there is significantly more cellulose than kernel per plant.” Of algae specifically, the report states that “according to some technology developers, algae are capable of producing ten to thirty times more oil per acre than the crops currently use for biofuels production.” Algae can also be grown in saltwater ponds and on other non-arable lands. Exxon Mobile Corp. recently invested $600 million in research and development of algae biofuels. Ford Motor Co. has also been researching the potential of algae as a biofuel. An explanation of the technology explains that the algae feed themselves on fatty oils, doubling in size every six hours. The article explains that the algae is dried, the oil is wrung out, and then it is shipped to a refinery. The result is diesel fuel that “is chemically indistinguishable from its petroleum-based equivalent.” The algae basically grow and fill with oil, using sunlight to the convert carbon dioxide they absorb into sugar and chemical energy. When the fuel is burned, the algae release the carbon dioxide it absorbed, “making the fuel theoretically zero-carbon, although processing and transporting the fuel requires some energy,” The Gaurdian says. Even with recent investments, algae biofuel production is not yet viable on a commercial scale. The fuel is expensive to produce because the plants have certain heat requirements in order to grow successfully. Algae not produced in lakes are grown in clear tubes called bioreactors. But for the organisms to grow in these tubes, the plants require energy to move them around so they receive enough light, says a study highlighted by Treehugger. In such cases, the carbon footprint of the biofuel is more than three times greater than the fossil fuel it would replace. Still, U.S. agencies’ use of the fuel signals a shift. The Navy announced that it plans to cut its use of fossil fuel in half by 2020, partly through the use of biofuels. The agency has just launched a new boat that is now running off a 50-50 fossil fuel/algae-based biofuel mix. According to the article, the Navy bought 20,055 gallons of the biofuel at the cost of $424 per gallon. Even the U.S. Airforce is also looking to increase its use of alternative fuels before the next decade. The EPA also found that when looking at the entire lifecycle of algae, the plant significantly reduces GHG emissions when compared with gasoline or fuel. Nevertheless, there are a number of factors that need to be addressed and understood. Plus there are many more ways in the near term to reduce GHG emissions and lessen the impact of pollution from the transportation sector.